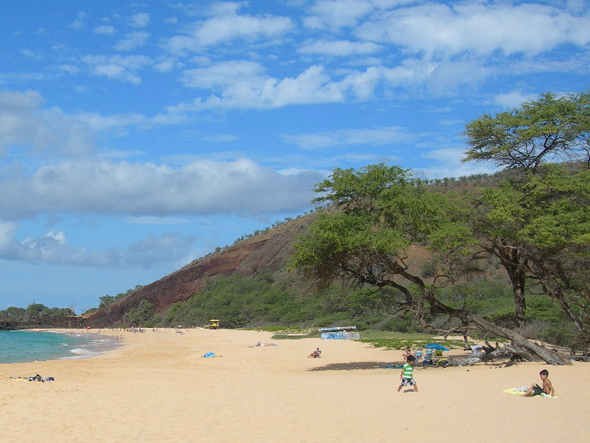 Oneloa Beach in South Maui is more commonly known as Makena Beach or Big Beach, Maui. This incredible stretch of white sand is over 2/3 of a mile long, and is more than 100 yards wide! 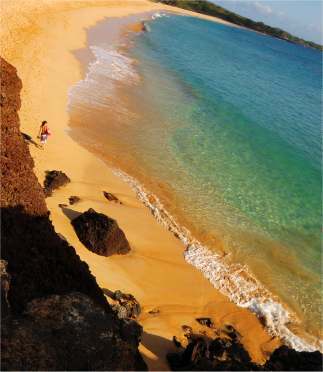 It's no wonder the locals refer to this beach as "Big Beach"! 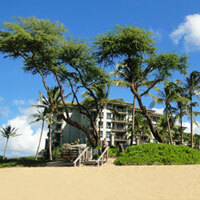 This beach is beautifully wild and undeveloped, with sinewy Kiawe trees thriving in the sand dunes behind the beach. It's bordered on either end by lava rock protrusions, the largest of which is on the North end of the beach and separates it from it's free-spirited cousin, Little Beach, Maui. They definitely don't make beaches like this where I come from! Here's a Kiawe Tree - Look Out for the Thorns Though! I love big waves, and this beach is known for that, especially during the spring and summer! However, the high surf brings with it some dangers, and it's advised that you stay out of the water if the surf is high. Can you swim at this beach? Absolutely! But before you go into the water here, it's crucial that you understand the shorebreak conditions that can occur, and what that could mean to YOU! Oneloa Beach drops off steeply into the ocean, with some parts of the beach being worse than others - this makes it more prone to dangerous shorebreak conditions compared to many other beaches. These high waves can be so rough, that they have resulted in serious neck and spinal cord injuries. This is especially likely if one is trying to boogieboard, or surf. Another thing to be cautious of at this beach are the strong rip currents here. As of May 2009, there are now lifeguards at this beach, which is great! They will be able to help you decide what activities are safe for you and your family on any given day. But what if you happen to be at beach when the lifeguards are NOT on duty? How are tourists like you and I supposed to know if the beach is safe? 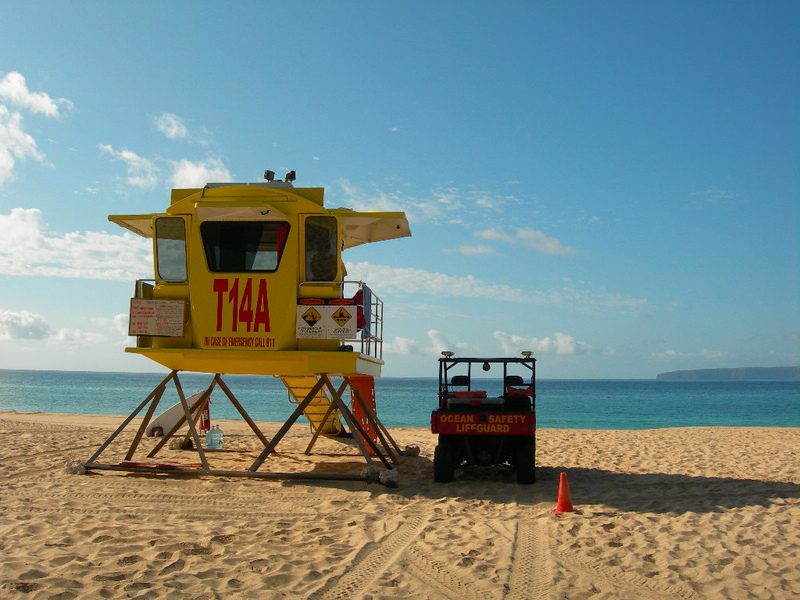 Well, I've found a great site established by the Hawaii Lifeguard Association, the County of Maui and others, which provides information on beach conditions for people like us! This site (link opens in new window) tells you the surf conditions, weather and more! Of course, you'll still have to use your own judgement when you arrive at the beach, and remember, surf conditions can change quickly, so stay alert, and be safe! There is no fresh water, so be sure to pack your own! When it's time for lunch, there are picnic tables available. The beach is only open during the day... the park gates are locked in the evening. This isn't the only Oneloa Beach on Maui. 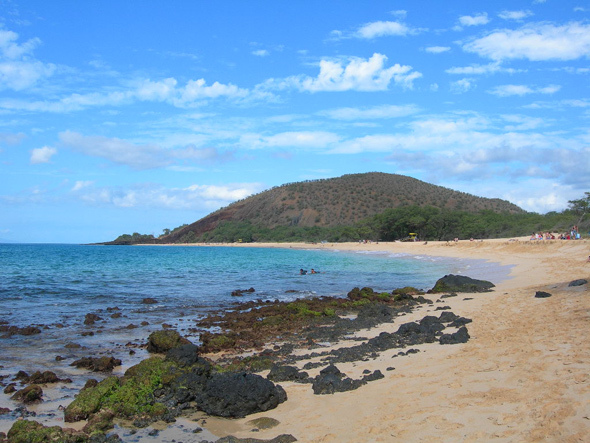 There is another beach by the same name in West Maui - it's a much smaller beach, and is located in front of exclusive condos and villas. 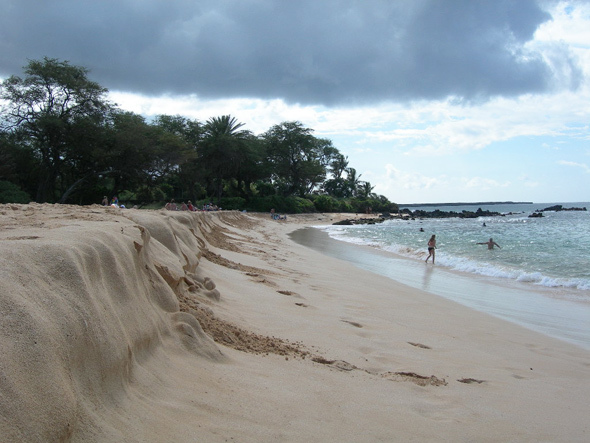 This beach is located in Makena State Park, south of Kihei and Wailea. 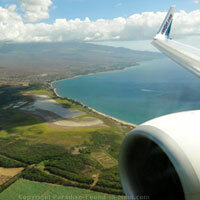 From Kihei, follow the Piilani Highway until it turns to the west and becomes Wailea Ike Drive. Across from the Shops at Wailea, it forms a dead-end, and you must turn left (south) onto Wailea Alanui Drive. This road eventually changes its name to Makena Alanui Road. Shortly before Makena State Park, this road changes names yet again, and becomes South Makena Road. Follow this road until the turn-off to Makena State Park. Do you see that long stretch of sand on the Google map below? That's Oneloa Beach (a.k.a. 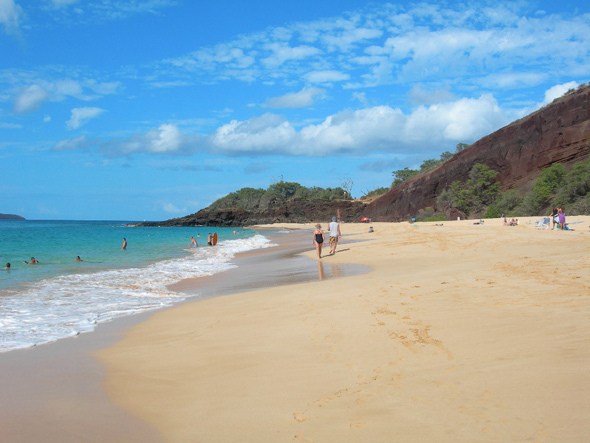 Makena Beach or Big Beach, Maui)! 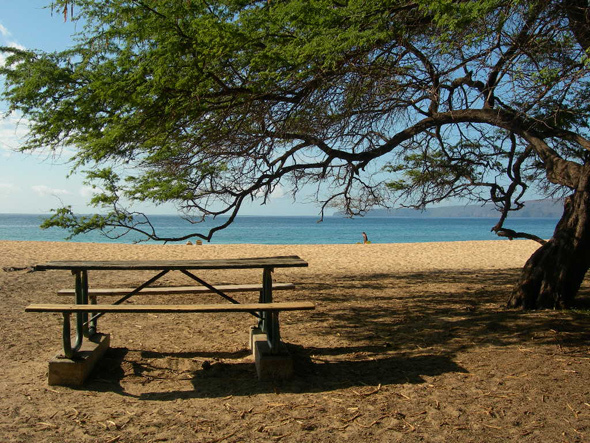 If you're looking for something more affordable, then you should look for a place in the nearby town of Kihei. On the other hand, if your accommodations budget is a bit larger and you want some luxury, then I recommend you search in Wailea. It's a few minutes closer to Big Beach than Kihei (via car), and offers a large selection of high-end resorts and condo rentals. 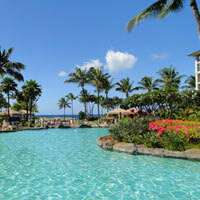 1) Since you'll be driving past Wailea to get here, why not read more about the Wailea area here? 2) And, since one beach can't possibly be enough, click here for my guide to the best beaches in Maui!